The avalanche danger is HIGH at the mid and upper elevations, and CONSIDERABLE at low elevations. Heavy snowfall expected today, after several days of heavy snowfall and strong winds, have created dangerous avalanche conditions in the backcountry, and travel in avalanche terrain is not recommended. For those that do choose to enter the backcountry, stay off of and out from underneath slopes steeper than 30 degrees. Also avoid traveling in valley bottoms below the runout of avalanche paths. Cornices are large and sensitive, so avoid traveling close to the edges of corniced ridges. Overnight snowfall totals range from 6-15”, with the highest amounts reported in the Cottonwoods. Winds have relaxed somewhat, and are gusting in the teens to twenties along some ridge tops from the west/southwest. Mid elevation stations are reporting generally light winds. Temperatures are in the mid teens and it is snowing heavily. Since the storm began on Sunday, the Salt Lake mountains have recorded over 4' of snow and over 5" of water. The Park City mountains have over 3' of snow and 3" of water. Moderate to strong winds, mostly along ridgetops but occasionally getting into mid elevation terrain, have also added stress to the snowpack. These are significant loading events. For today, heavy snowfall is forecasted with another 12-16" expected by sundown. Winds will shift to the northwest this morning, gusting into the 20's and low 30's along upper elevation ridgelines. Occasional periods of heavy snowfall can be expected throughout the day. 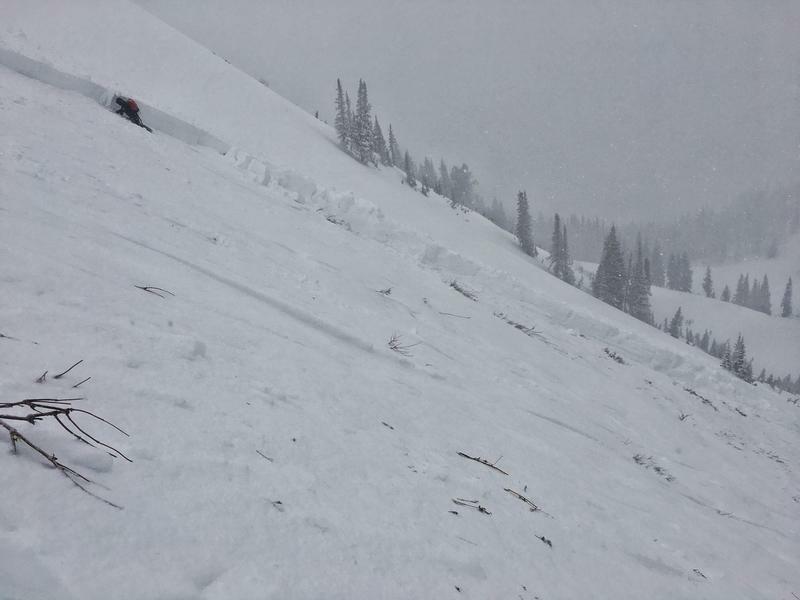 A couple of significant natural avalanches occurred on Tuesday along the Park City ridgeline. These were on northeast aspects that were wind-loaded from the sustained period of strong southwest winds. 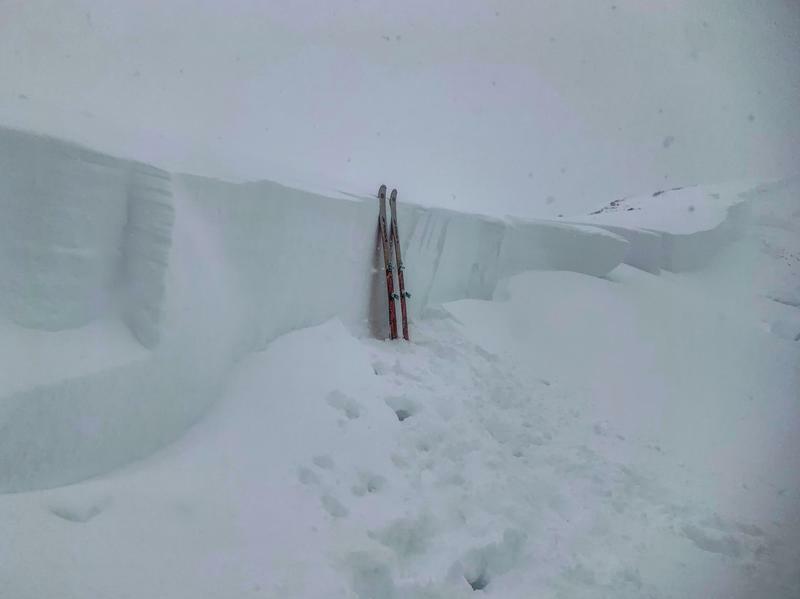 These avalanches were likely triggered from natural cornice falls, and were on slopes that have previously avalanched this season (known as "repeaters"). These slides included Scott's Peak (observation), but the attention-getter was South Monitor which had a crown up to 8' thick and ran over 1/4 mile wide. You can read Mark White's usual excellent writeup and photos on this observation. Although much less dramatic than what is shown above, yesterday my partner and I noted three different avalanches in Days Draw (observation). These were failing on a density inversion within the storm snow. With heavy snowfall overnight and forecasted throughout the day, both human and natural avalanches are likely. You can expect both sluffing in the storm snow, as well as possible sensitive storm slabs, especially during any period of heavy precipitation or wind. Sluffs may run fast and far, and storm slabs may be up to 12-18" thick.